At a press conference in Madrid last week, [French] Foreign Minister Alain Juppe publicly declared that “there will be no solution to the conflict in the Middle East without recognition of two nation-states for two peoples. The nation-state of Israel for the Jewish people, and the nation-state of Palestine for the Palestinian people.” Then, lest anyone overlook the statement’s significance or think it a mere slip of the tongue, his ministry yesterday circulated copies of it. So what made Sarkozy get off the fence and approve Juppe’s public declaration of support for a Jewish state? It’s not that he suddenly joined the Zionist movement; neither have most of the countries favoring such language. Rather, they have finally grasped that no agreement is possible without satisfying Israel’s minimum requirements. No Israeli government will ever sign a deal that mandates full withdrawal to the 1967 lines, lacks adequate security provisions or doesn’t acknowledge Israel as a Jewish state. The major Israeli parties differ on precisely where the border should run and precisely what security arrangements are required, but they all agree on these basics. 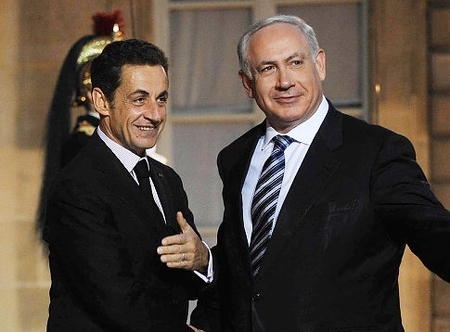 Sarkozy, however, has now gone one step further: He’s realized since Israel won’t sign a deal without such provisions, Europe does need to start publicly demanding these concessions of the Palestinians. Otherwise, they will keep deluding themselves the world will eventually force a complete Israeli capitulation. You will recall that President Obama also referred to “Israel as a Jewish state and the homeland for the Jewish people” in his May 16 proposal. But he did not insist that the Palestinians agree to it before Israel withdraws to pre-1967 lines! This makes his statement no more than window-dressing. According to Israeli officials, EU foreign policy czar Catherine Ashton adamantly opposes any mention of Israel as a Jewish state, as do Spain, Portugal, Britain, Ireland, Belgium, Slovenia, Austria and Luxembourg. In contrast, such language is favored by Germany, Denmark, Holland, Italy, Romania, Poland and the Czech Republic. The Palestinians have explicitly rejected Sarkozy’s initiative, as I wrote on Thursday. They think that they have already made a great concession by agreeing that they will permit something called Israel to exist at all, at least until they can change it into an Arab-majority state by settling the descendents of Arab refugees there. And the Quartet did not accept Sarkozy’s formulation either, in deference to the Arabs. There is a gulf between Israel and the Arabs that cannot be crossed by any creative compromise, because it’s simply the question of will there or won’t there be a Jewish state. This has always been true — recall President Clinton’s unsuccessful struggle to get Arafat to fulfill his Oslo commitment to remove parts of the PLO charter calling for the destruction of Israel — but now it is clearer than ever. Expect, therefore, that the Palestinians will pursue a unilateral path to statehood. If this train isn’t derailed by unilateral Israeli action — for example, the annexation of part or all of the territories — it will ultimately get to the Security Council, and President Obama will have to decide to cast a veto or not. Either course will be difficult for him, and I don’t think a veto is a forgone conclusion. There is another possibility, which is not to be discounted. That is that the next war — most think that a conflict between Israel and at least Hizballah and Hamas is inevitable — will be of such character as to significantly change the facts on the ground. The settlement of that war will then determine whether 1) there will remain a weak, attenuated Israel with a Gaza-like terror state next door, or instead, 2) there will be a healthy Jewish state in control of its historical homeland, with Hizballah and Hamas finally broken, without the capability to threaten it. 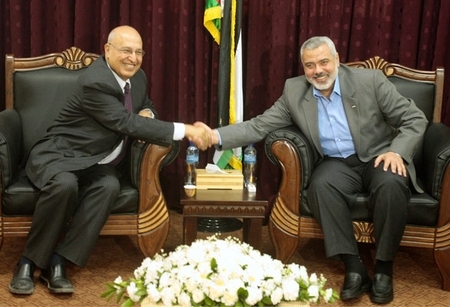 Nabil Shaath (left) shakes hands with Hamas leader Ismail Haniyya after Hamas/Fatah agreement this May. False optimism in the service of peace is no virtue. Peres said that both the Israeli people and their government support a two-state solution. A recent poll commissioned by The Israel Project shows that Palestinians in the West Bank are supportive of negotiations with Israel as a path to peace. The poll also shows that they view their well-being – getting jobs, healthcare and investments – as a new priority in the Arab Spring. As far as economic issues, it’s true that they chose jobs as the top priority of a Palestinian government — but only because no option relating to the elimination of Israel was offered! If the Palestinian in the street doesn’t want ‘two states for two peoples’, who does? How about the moderate elements in the leadership? [The French initiative] reshaped the issue of the “Jewish state” into a formula that is also unacceptable to us – two states for two peoples. They can describe Israel itself as a state for two peoples, but we will be a state for one people. The story of “two states for two peoples” means that there will be a Jewish people over there and a Palestinian people here. We will never accept this – not as part of the French initiative and not as part of the American initiative. 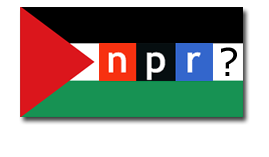 We will not sacrifice the 1.5 million Palestinians with Israeli citizenship who live within the 1948 borders, and we will never agree to a clause preventing the Palestinian refugees from returning to their country. We will not accept this, whether the initiative is French, American, or Czechoslovakian. Here Shaath explains what the PA understands as the kind of ‘two-state’ solution that they will accept: “A state for one people,” that is, the racist state east of the Green Line that Mahmoud Abbas was thinking of when he said that “no Israeli will remain” when ‘Palestine’ is declared, and “a state for two peoples”: Israel, which will be converted into an Arab-majority state when the descendents of the 1948 refugees join the Arab citizens of Israel. And what claims will they have, once they have a state in the presently disputed territories? Once admitted to the United Nations, our state stands ready to negotiate all core issues of the conflict with Israel. A key focus of negotiations will be reaching a just solution for Palestinian refugees based on Resolution 194, which the General Assembly passed in 1948. Resolution 194 does not in fact call for the admission of millions of hostile descendents of Arab refugees to be admitted to Israel. But it has always been interpreted as such by the Arabs. If the UN were to admit ‘Palestine’, it might be the first time a new state has been created whose essence is no more or less than the destruction of an existing member state. JERUSALEM (JTA) — Norway’s ambassador to Israel drew distinctions between the Oslo and Utoya massacres and Palestinian terrorism. “In the case of the terror attack in Norway, the murderer had an ideology that says that Norway, particularly the Labor Party, is forgoing Norwegian culture,” Sevje said, referring to suspect Anders Breivik, a Christian nativist who is opently anti-Islam and anti-immigration. Unlike European Union states, Norway has engaged Hamas and often been fiercely critical of Israel, to Jerusalem’s dismay. While Sevje voiced sympathy for Israeli terror victims, having experienced “the inferno” of such attacks during his posting, he saw little chance of Norway reviewing its Middle East policies. In other words, Israelis suffer because they oppress the Palestinians, Norwegians because they support them in their ‘righteous’ struggle. We deserve ours because we’re evil; they got theirs because they were virtuous. (Thanks to Lise Rosenthal for this formulation). This is a long post. But if you get bored, please make sure you read the last few paragraphs where the rest of the story is presented. 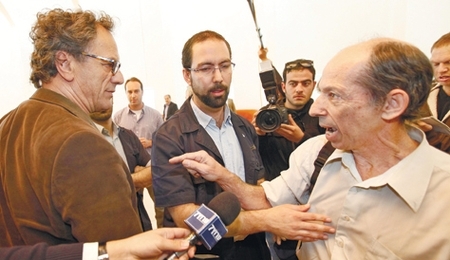 In dismissing the suit, the judges ruled that even though Bakri’s film was “full of things that are not true” and even though it was hurtful to the feelings of the five soldiers, there was no provision under the law for them to bring a civil claim against Bakri because the film made reference to the IDF’s operations in Jenin as a whole and not to any specific soldier. Almost certainly this puts a final end to the issue: Bakri, who deliberately made a film full of vicious lies in order to promote the destruction of the state of which he is a citizen and which gives him the opportunity to practice his ‘art’, will suffer no negative consequences for it. Bakri’s latest film was made in 2005, about his difficulties after Jenin, Jenin. On June 18, this film was screened in New York in an event paid for by the New Israel Fund (NIF). You can read the NIF’s fulsome account of it here, including the repetition of some of the lies told by this “esteemed actor and director” (their words). Let’s see: the NIF supported most of the NGOs that provided material for the Goldstone Report, it supported a coalition of groups that advocate an economic boycott of Israel, and it supports groups who are practicing ‘lawfare’ against Israel, including the arrest of Israelis in Europe for ‘war crimes’ (all of this is documented here). Now it is paying to provide an audience for an admitted liar and anti-Israel propagandist in the US! How long will it take for the liberal American Jews who support the NIF — including Rabbi Richard Jacobs, head of the Union for Reform Judaism — to learn whom they are really helping?